Hmmm … it’s almost time to say goodbye Rotterdam, but as you may have heard … Strange Fruit most definitely plans to go out with a bang!! So for the last Rotterdam gig we invited UK based DJ Mosca and to ease you into it (cause this is not for the fainthearted) here’s his “5000 followers EP”. A bangin Freebie he released when he hit 5000 follower mark on twitter over 8 months ago and since his twitter follower count is up to 11.310 now …. That should tell you sumthin!! I guess we’ll see yah tonight!! 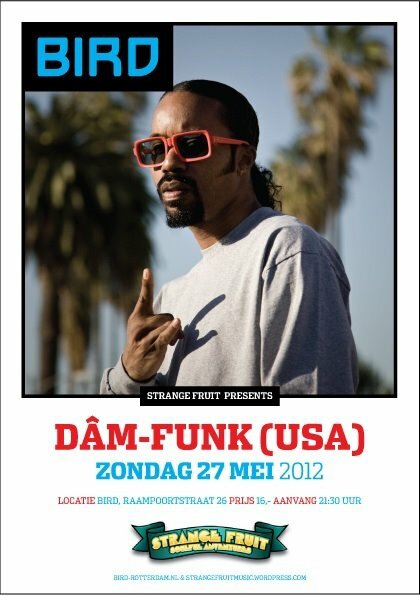 Rotterdam – Strange Fruit staat al jaren garant voor zeer dansbare avonden vol boogie, electronica, house, dubstep, UK Funky en vooruitstrevende soul en hiphop. Met andere woorden: de allerbeste soulvolle electronica, waarbij DJ’s en live-acts uitstekend blijken samen te gaan. 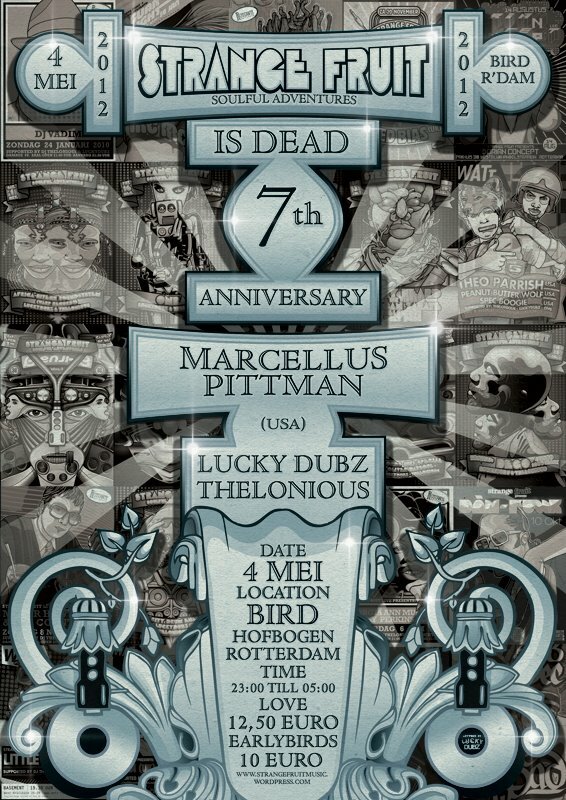 Voor de verjaardag van Strange Fruit op 4 mei hebben DJ’s Thelonious en Lucky Dubz wederom een legende naar BIRD gehaald: Marcellus Pittman. Marcellus Pittman is geboren en getogen in Detroit, waar hij zijn jonge jaren doorbracht luisterend naar de radio, naar de geluiden van The Wizzard en Electrifying Mojo. In de jaren negentig begon hij met draaien op schoolfeesten en bruiloften en niet lang daarna bracht hij Essential Selections, Vol. 1 uit bij Sound Signature, het label van Theo Parrish. Met hem, Rick Wilhite en Kenny ‘Moodymann’ Dixon vormde hij eind jaren negentig de 3 Chairs, een samenwerking die Detroit House verder heeft helpen ontwikkelen. Pittmans geluid is inmiddels overal bekend: in Detroit, maar ook in Canada, Engeland, Duitsland, Japan en Parijs. Momenteel is hij bezig met zijn eigen projecten op zijn label Unirhythm. En vanavond is hij in BIRD om het zevenjarig bestaan van Strange Fruit te vieren met veel dansbare disco, soul, funk en natuurlijk Detroit house. Tracklist: Scott Grooves – ? This can actually be a really short post, cause frequent Strangefruitmusic visitors already know that whatever Mar”s name is attached to …. is going to be a snooth musical experience. I’ve been keeping an eye on his “Seeing her Naked” release ever since the track “Our Attempt” was poppin up all over the net. But since it made me anxious and impatient, I decided that no Strangefruitmusic reader should experience the agony of waiting for this musical gem. Instead of enticing you with just one track, Noggy decided to let Mar overwhelm you with the full release of “Seeing her naked” (believe me ..you will be thankful after streaming). Since Okayplayer already compared him to Miguel, Frank Ocean and Abel Tesfaye (the Weeknd) there is not much left to say except for enjoy the ride. 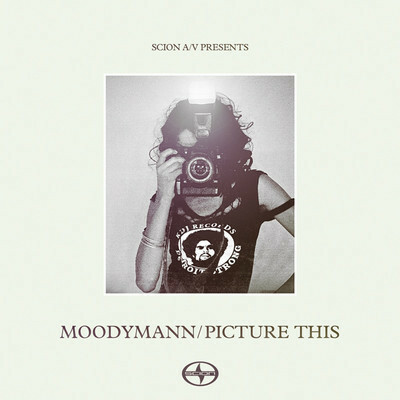 Yep Noggy here … hitting you up with Moodymann’s latest. These tracks are meant to hypnotize and not analyze, so I’m going to keep this short. It’s an 8 track detroit house exclusive banger, provided by Scion AV!! You can get it for free here. We knew something was up as soon as we heard the first “analogue monsta mix” way back in 2011. 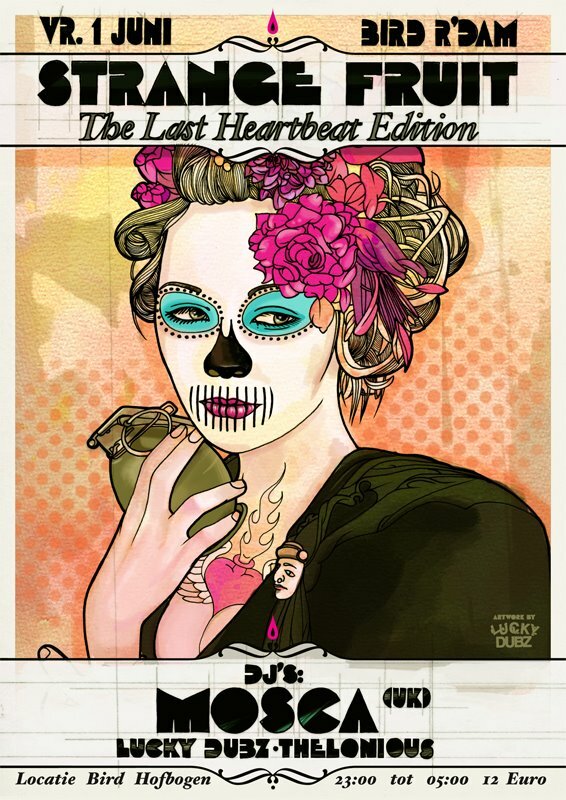 Since I hold both Tokimonsta and Suzi Analogue in high esteem … I am not surprised their first collaborative effort turned out so well. Suzi’s NNXTAPE is still on very heavy rotation and Tokimonsta’s “Darkest Dim” still has this surreal feel to it, that makes you want to listen to it over and over again. 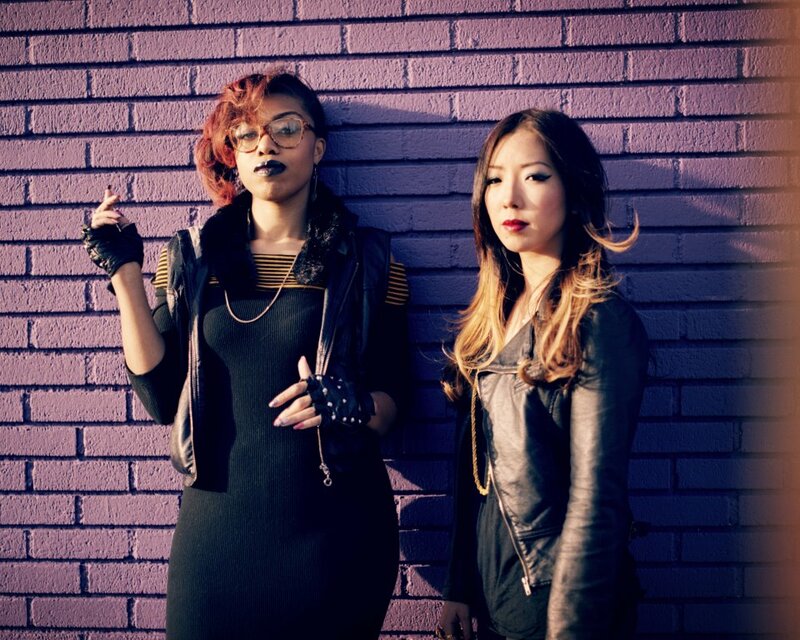 Needless to say I am anxious to hear a lot more from Anologue Monsta, a merge of two ladies with their own distinctive take on electronic music. 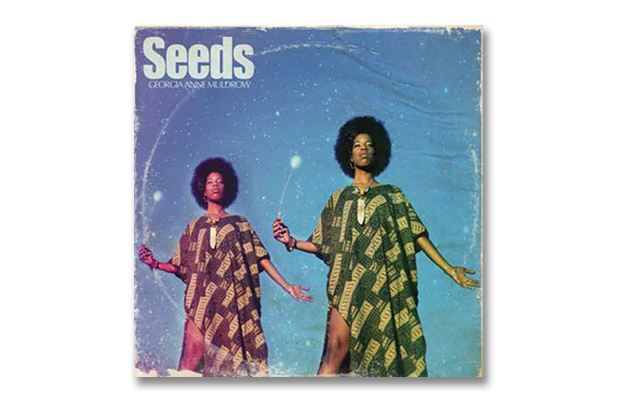 Almost forgot to remind ya’ll to cop the latest Georgia Anne Muldrow “Seeds”. Produced by Madlib there was 99.9 percent change this release would turn out to be a musical master piece. The blend of the slightly diverse aproach to music of Georgia Anne Muldrow and Madlib turned out to be a stroke of genius. The result is absolutely worthy of a spin.